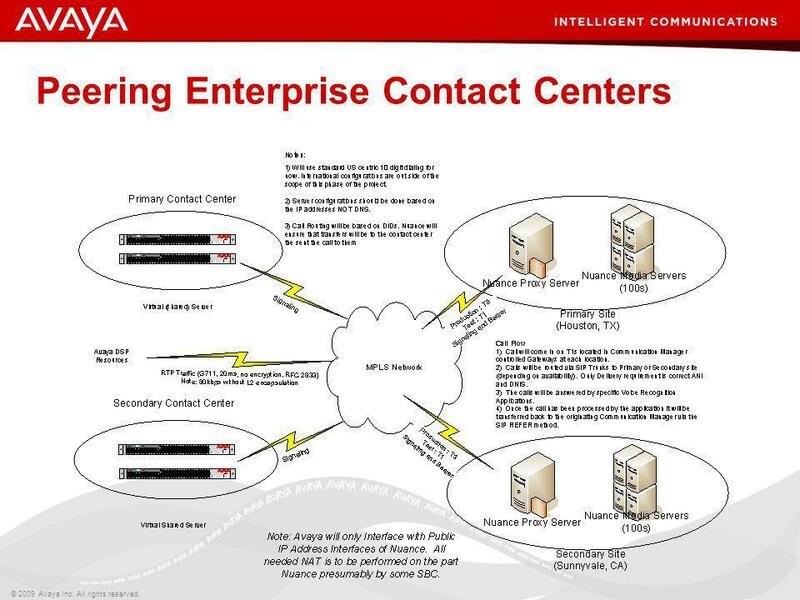 Service Provider Enterprise / Contact Center (one or multiple locations) Enterprise / Contact Center Application Servers Public SIP Trunking Public SIP Trunks are used to provide access to the PSTN through SIP-enabled Service Providers such as AT&T and Verizon Business. 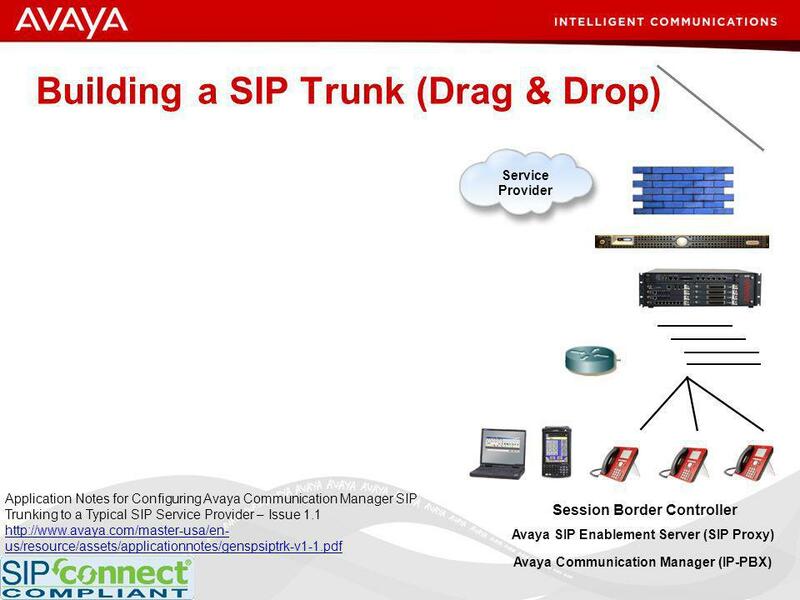 Communication Manager 4.0 and later support direct SIP trunking to SIP Service Providers without the SIP Enablement Services (SES). If the SIP Service Provider does not support TCP or TLS, Communication Manager will need to interface to a Session Border Controller such as the Covergence SBC to perform protocol conversion from TCP or TLS to UDP. 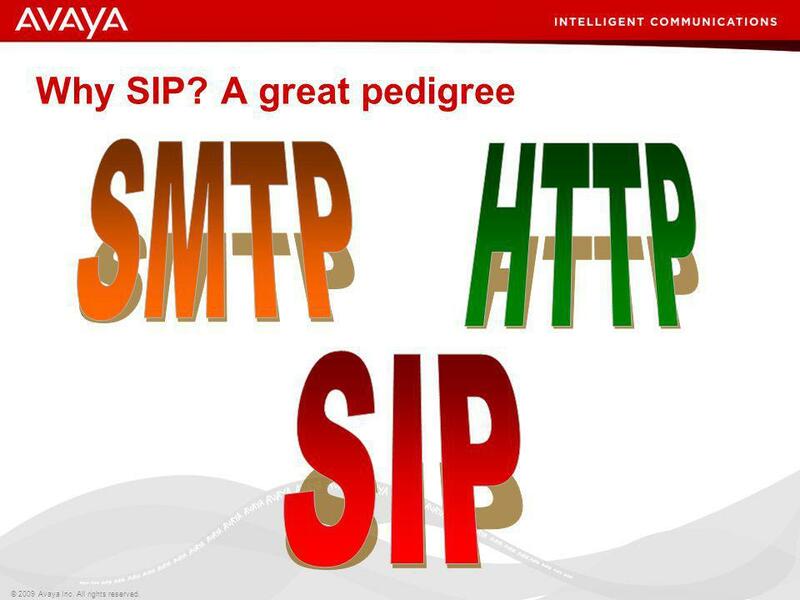 Communication Manager supports SIP over TCP and TLS whereas most SIP Service Providers only support UDP. 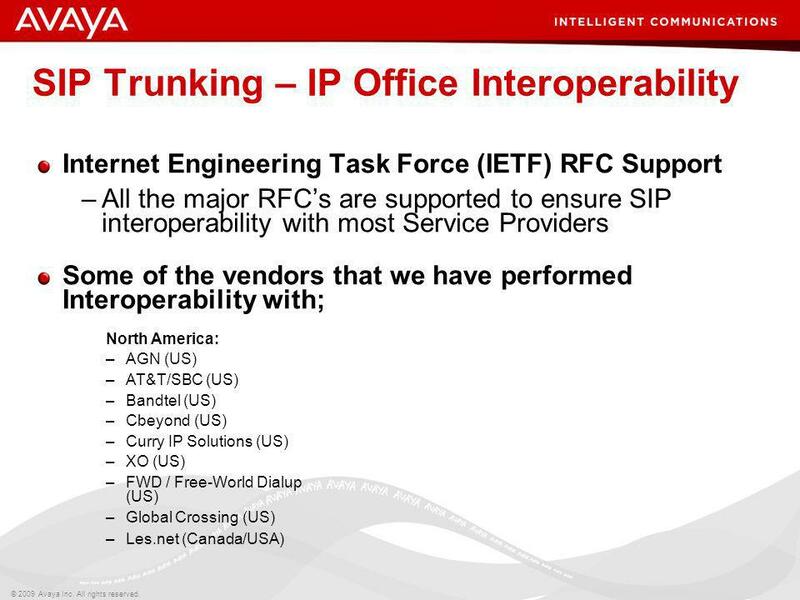 For U.S. Service Providers, DevConnect testing for Public SIP Trunking is highly recommended, but not required. 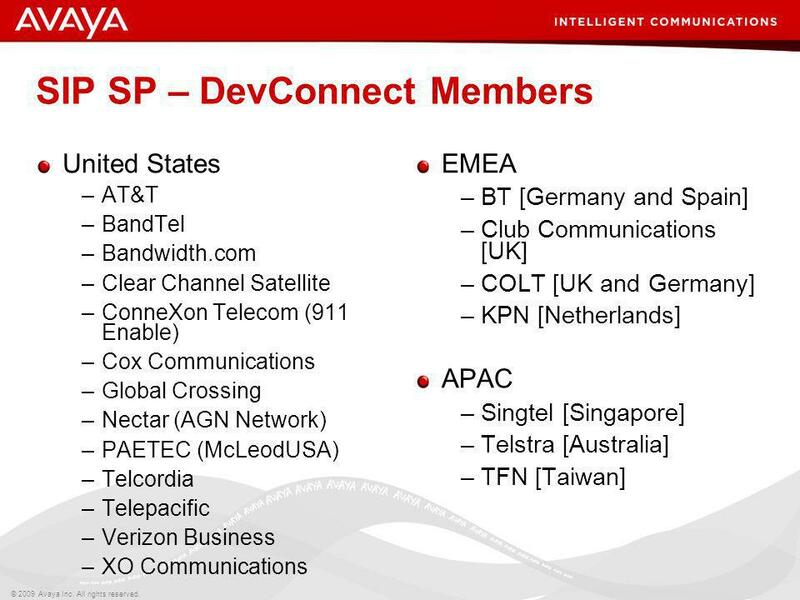 For non-U.S. Service Providers, DevConnect testing for Public SIP Trunking is required. 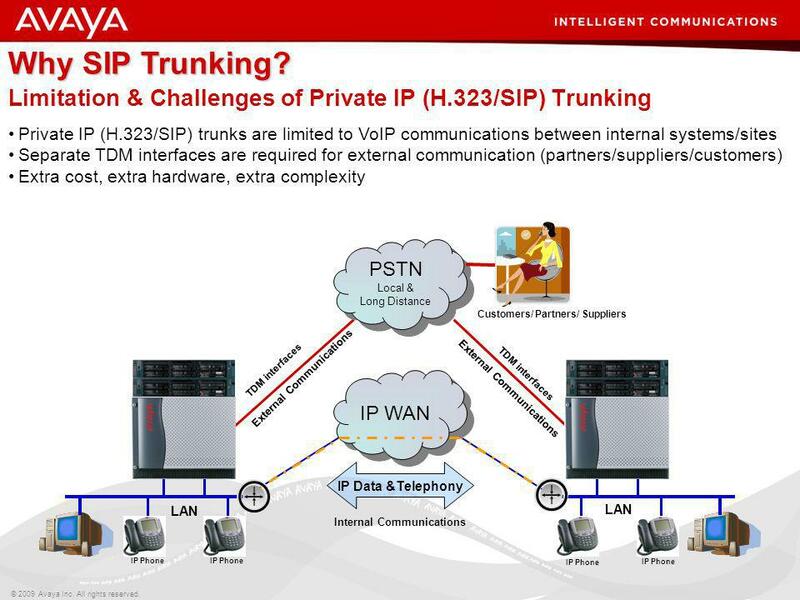 Private SIP Trunking Private SIP Trunks are used to network Communication Manager to other SIP devices within the Enterprise such as other Communication Manger instances or even third-party PBXs. 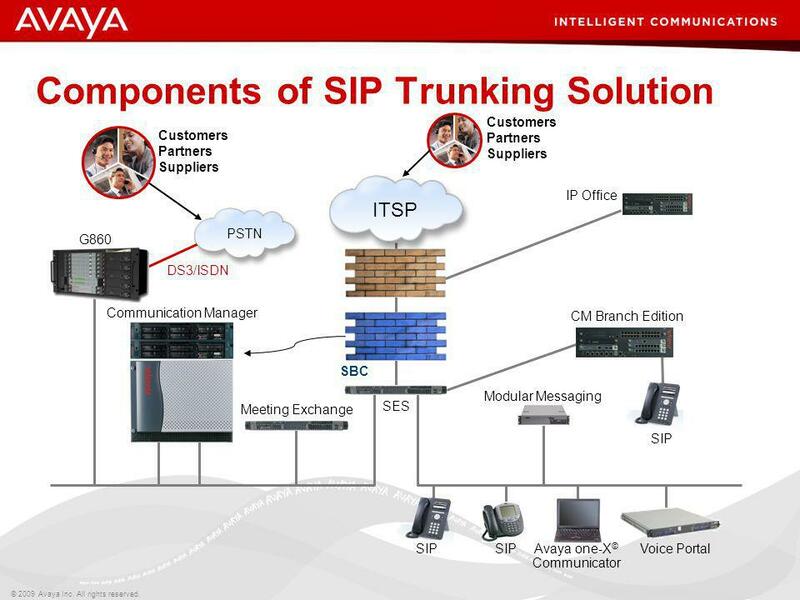 Communication Manager Private SIP Trunking to 3rd party (non-Avaya) SIP devices, PBXs, gateways, applications, etc. require CM product management approval. 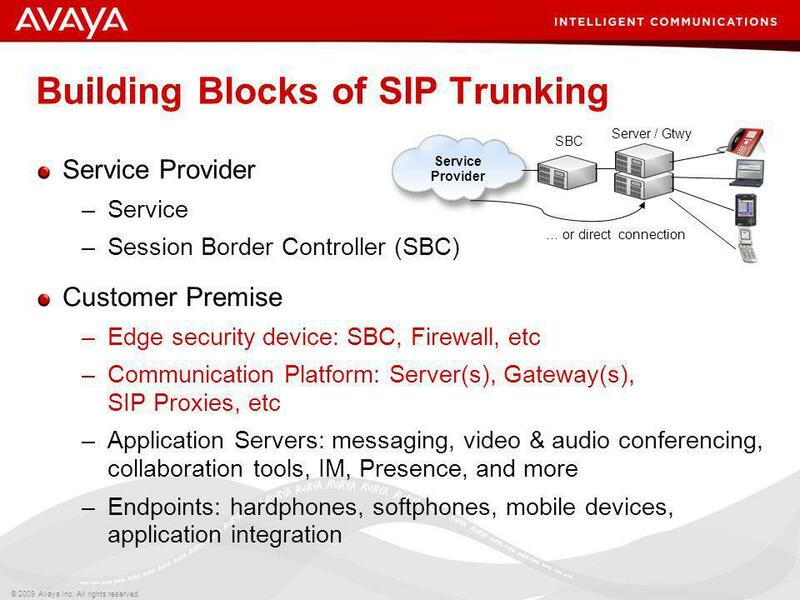 This is true regardless of whether there is an Avaya SES or a SIP Proxy in an element such as a Session Border Controller in the configuration. 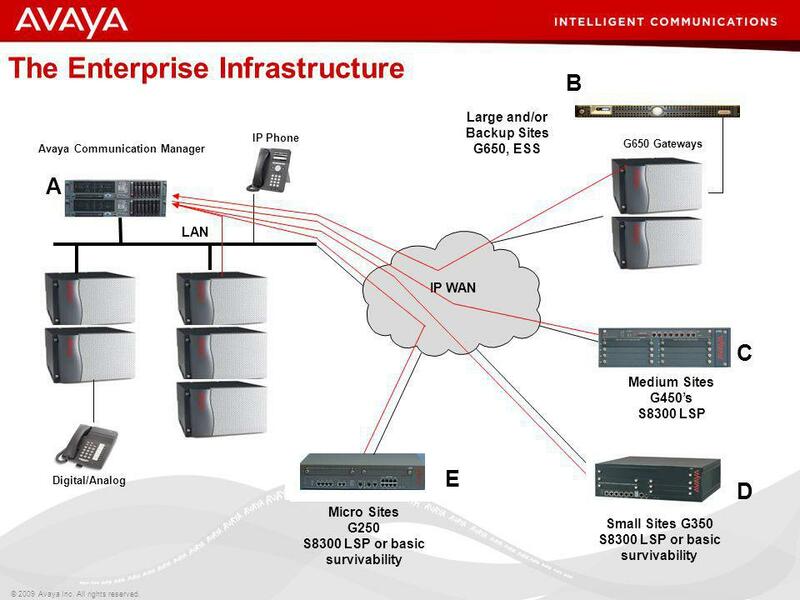 Product management will take the following into consideration in making its approval decision: Customer relationship Business opportunity/revenue potential 3rd party device/manufacturer Prior experience with similar configurations Successful testing via Proof of Concept lab, System Interoperability Test Lab, or DevConnect lab SIP trunking can be over the LAN, WAN or dedicated circuits. 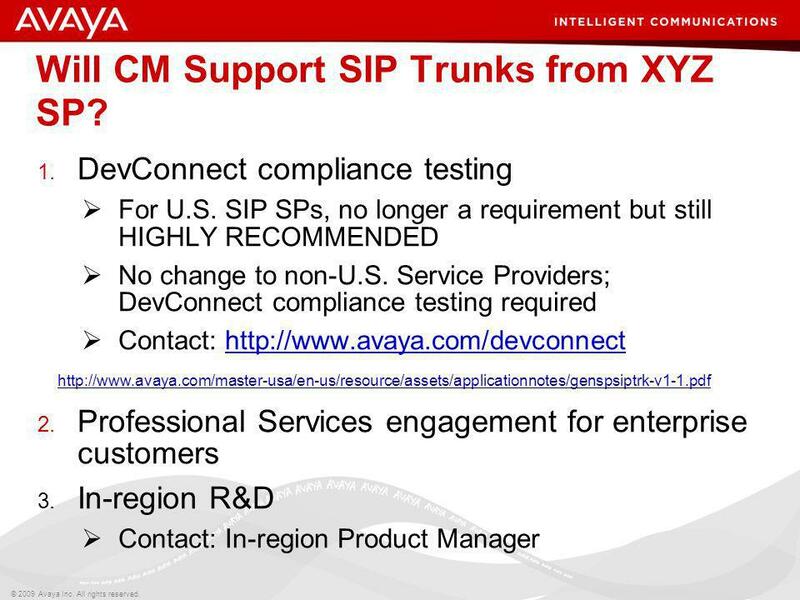 10 Will CM Support SIP Trunks from XYZ SP? 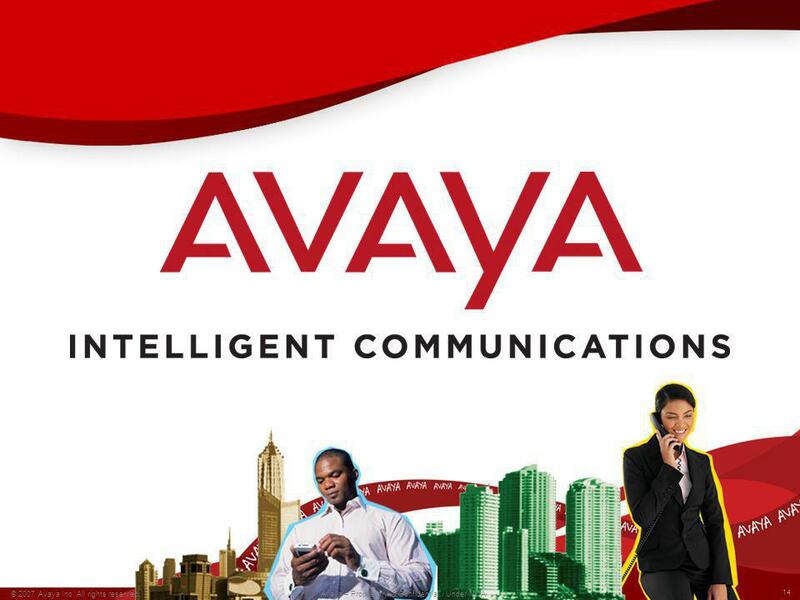 14 © 2007 Avaya Inc. All rights reserved. If the Far-end Domain is filled out then the “Request URI” and the “To” headers will reflect the information. The Public-unknown numbering plan inserts the From extension. 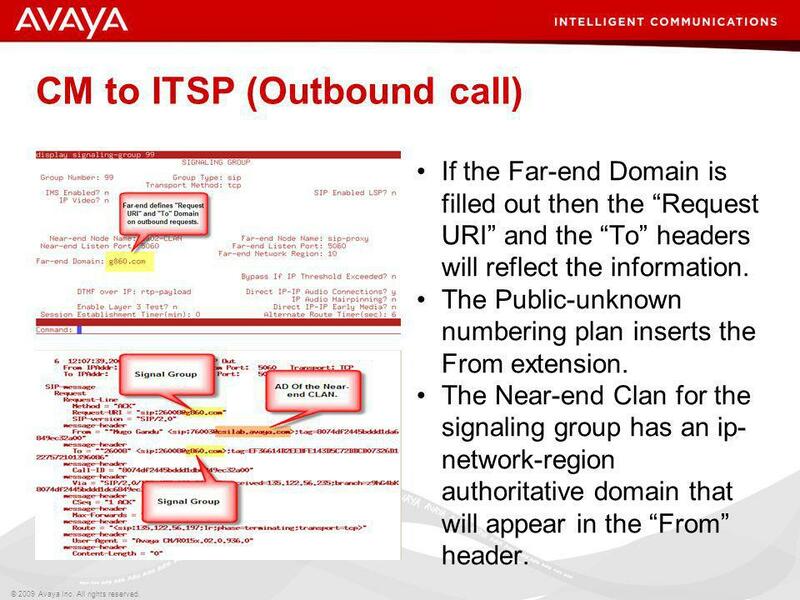 The Near-end Clan for the signaling group has an ip-network-region authoritative domain that will appear in the “From” header. Understand that the URI is the routable portion of the request where the To is the Logical recipient of the request and the From is the Initiator of the request. 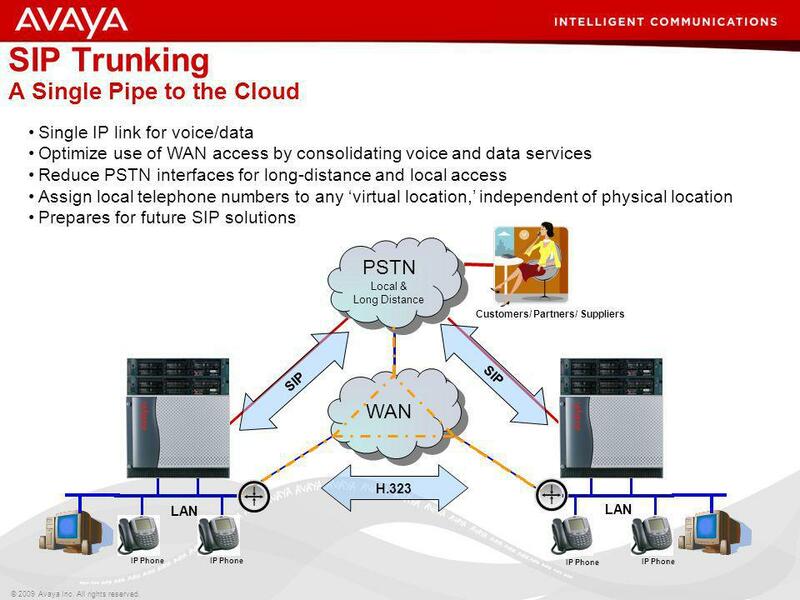 Download ppt "Introduction to SIP “Trunking” in the Enterprise"
Virtual Enterprise Solid Foundation for Evolution Communication Manager 5.0/SIP Enablement Services 5.0/Call Center 5.0 and associated new products and. © 2006 Cisco Systems, Inc. All rights reserved. 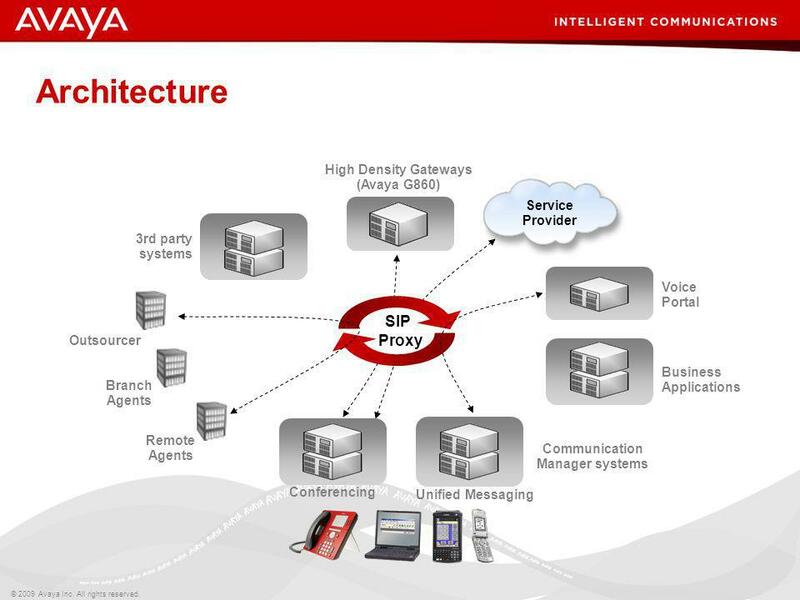 CUDN v Understanding Cisco Unity Bridge and Avaya Interoperability Migrating Voice Mail to Unified. © 2007 Cisco Systems, Inc. All rights reserved.Cisco Public 1 Design Clinic: Cisco UC Architecture for Corporate Branch Offices Tim Wellborn – CCIE #15397. 1 UCaaS Subscription Detail FunctionalitySupported Devices / Endpoints Types of UCaaS subscriptions EssentialBasicFoundationP1Professional Maximum # of. 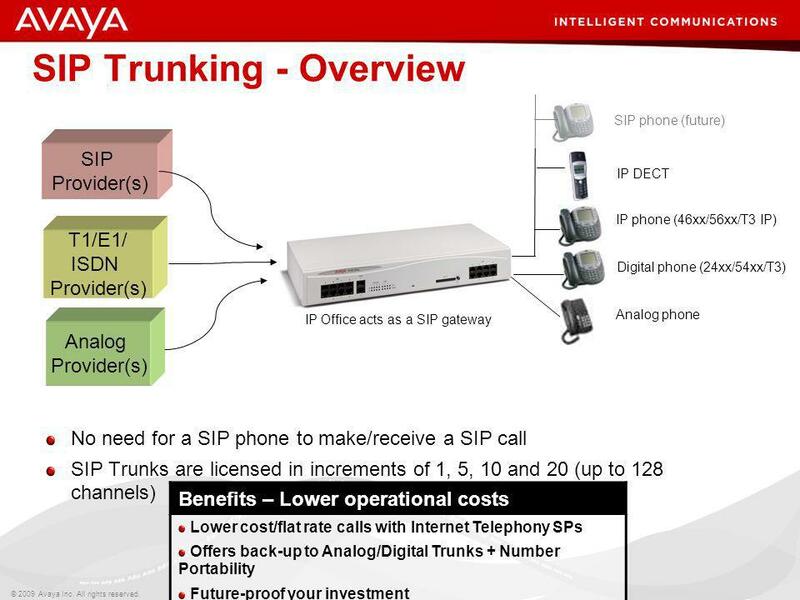 © 2011 Avaya Inc. All rights reserved. 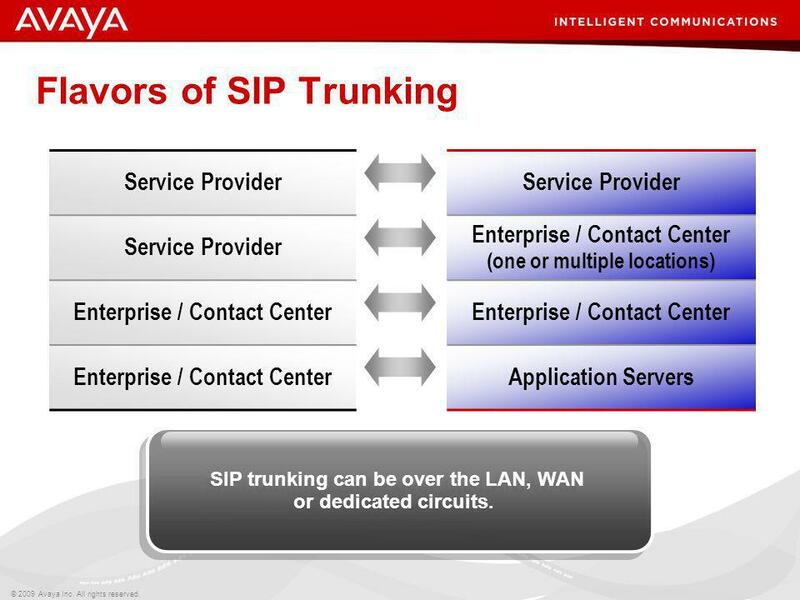 SIP Trunk Deployment Use Case WellStar Health System Jeff Ward Solution Architect Business Communications Solutions. All Rights Reserved © Alcatel-Lucent 2010 Jean-François Rey – Alcatel-Lucent offer manager October 2010 Leverage SIP for a smooth transformation plan to. EMEA Techshare 2009 The Future Begins SIP Trunking – Best Practices Aaron Miller Systems Engineer – SP Specialist April 1, 2009. Adoption of IP in the Next Generation Contact Center Rupesh ChokshiGautham NatarajanDirector, AT&T.